As part of its cleansing drive post the infamous dieselgate emission scandal, Volkswagen is currently offering buybacks to around 5 lakh affected owners in the United States. According to the court order that has instructed the automaker to buyback affected cars, Volkswagen will need to pay for every affected 2.0-litre TDI engine car, provided it is 'operable', i.e. it can be driven under its own 2.0-litre TDI engine. Exploiting this clause in the order, several VW owners are stripping down their cars prior to their buyback appointments. 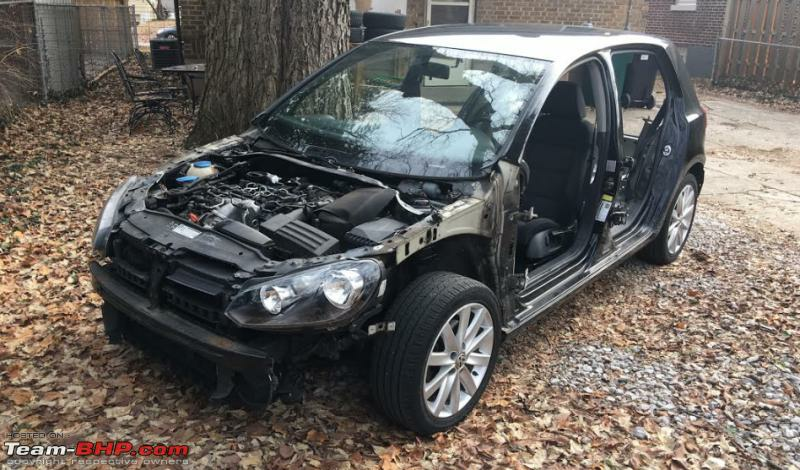 While some of these owners see it as an opportunity to mark their revenge against Volkswagen, for others it is just a way to make some quick money by selling off the stripped parts. 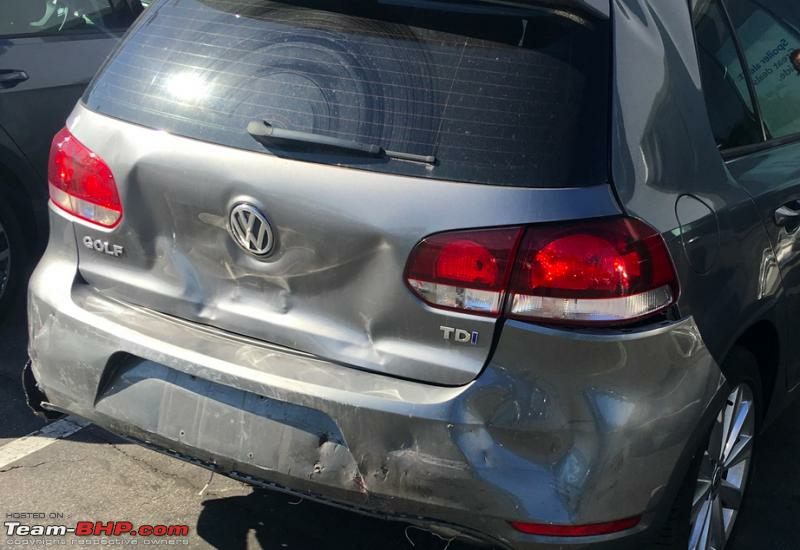 Several cases of owners returning stripped down VW cars have been reported on various portals. Some of them have been realistic and have just removed the aftermarket accessories they had installed post the purchase. However, there are a few disgruntled owners who have taken the word 'stripping down' quite seriously. 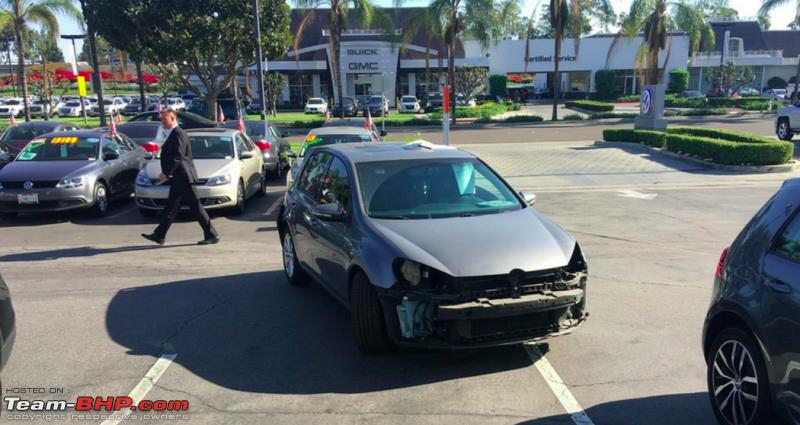 A Golf TDI owner literally removed his car's front fascia, including the front bumper, grille and headlamps. 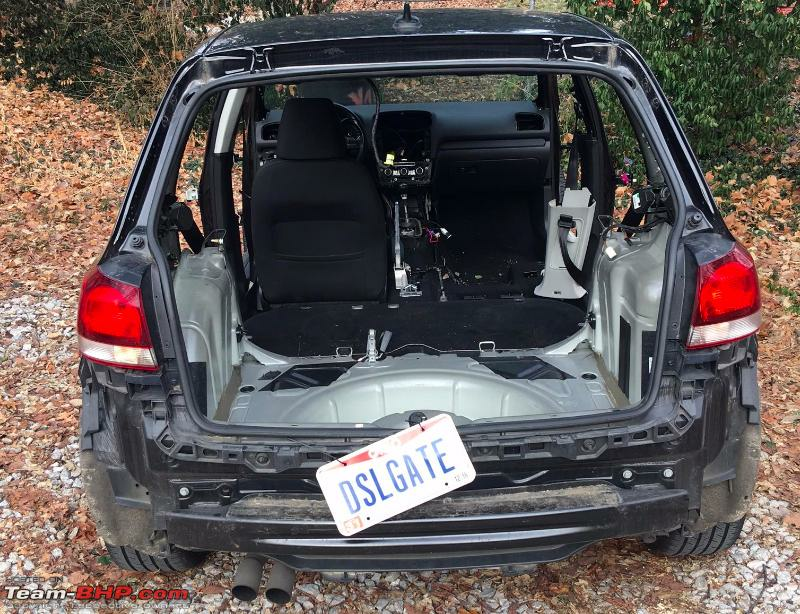 The back-end was also messed up with a heavily dented tailgate, which the owner claims was a result of an accident. Interestingly, he was paid the full buyback amount without any issues. This case appears to have given inspiration to many other owners, as soon after the aforementioned stripped down Golf was reported, another case came to light, though it was even more extreme than the earlier one. 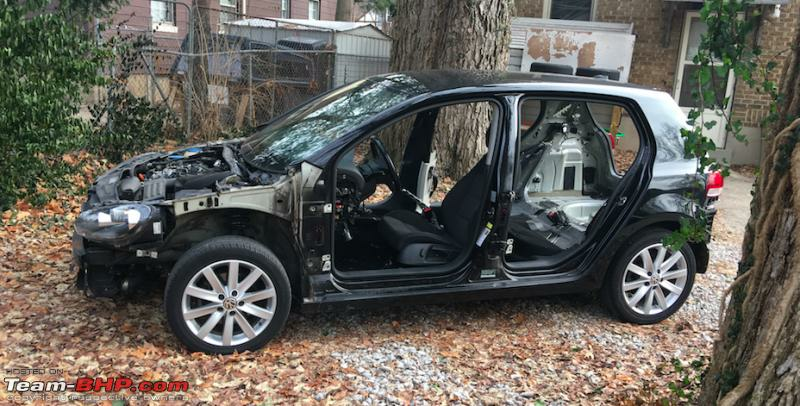 Joe Mayer, a car salesman, completely stripped off his 2010 Golf TDI ahead of his buyback appointment. He removed the car's doors, hood, front fenders, tailgate and bumpers. 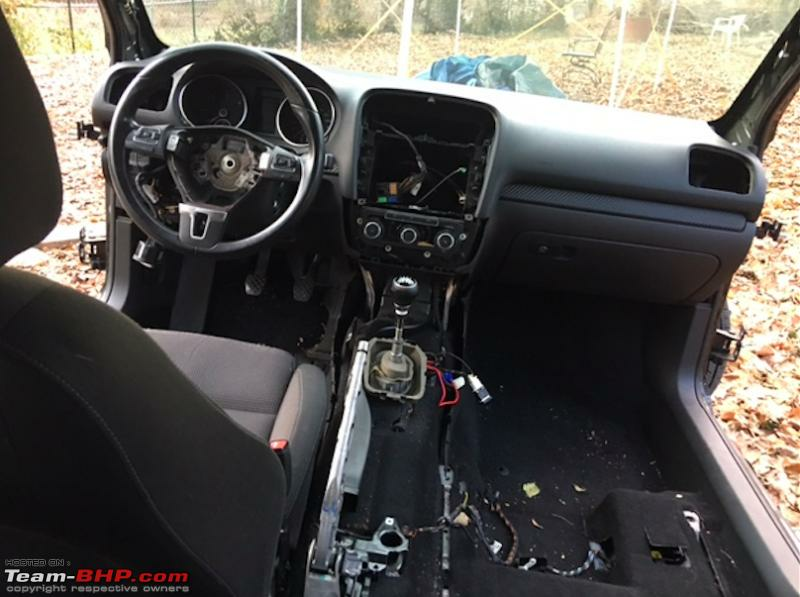 The interiors too were stripped down, including the seats, centre console, airbags and AC vents. However, since this story got a lot of publicity on the internet, Volkswagen played it smart and contacted the owner and informed him that stripping down cars wasn't in the 'spirit of the buyback' and postponed his appointment. Meanwhile, the judge handling the dieselgate case has taken notice of these practices from VW owners and has warned them to not indulge in such deliberate parts stripping. Restored my faith in the fact that human nature is similar, countries and race don't play much of a role. Would have been interesting to see the reactions of the company and the media had the same news been related to the Indian market. But then again, we will never get a full buy back deal, not even a complete recall. Unbridled greediness on part of the company earlier and some owners now. Excellent way to insure your future expenses. Tomorrow when you have, say, a broken light, no need to pay through your nose to buy something at 10x price from VW spares shop - because you already have a spare! Such a sorry sight. After looking at all these pictures the one thing I can say for sure is that none of the people who owned these VWs are car lovers. Somebody who loves his/her car and treats it as part of his/her family will never destroy them in this manner just to spite the manufacturing company. Agreed, VW is at fault, but 'disfiguring' these cars in such a manner is completely undignified on part of these owners. Just one word to describe this behaviour...GREED. Nothing else. But then again, we will never get a full buy back deal, not even a complete recall. No sir. All we get is a lousy car care kit & a remap that takes the engine punch away - link. A lot of these parts are making their way to craigslist.com. After looking at all these pictures the one thing I can say for sure is that none of the people who owned these VWs are car lovers. I'd say that, more than greed, it's anger at the blatant cheating by VW. Whoa! That's some revenge. People hardly get to take revenge on companies and why would they leave an opportunity when it presents itself. This is hilarious by some of the owners. Wonder if any of such companies would ever offer the same compensation to Indian owners... Such is the dichotomy of the companies where two different standards are applied to owners from different countries. Guess its up to our government to implement the laws. Had it been offered in India, VW India would have broken the record that GM took ages to achieve (http://www.team-bhp.com/forum/indian...net-worth.html) in just 1-2 months. VW gets a taste of it's own medicine and that too in plenty! Jokes apart it is not ethical to do so. What makes it worse is how VW is dishing out a different experience to it's Indian customers. Don't we deserve the same treatment, more so when you are considered as a premium brand in India? Last edited by GTO : 13th January 2017 at 17:01. Please. This is the least one can do when a corporation betrays the public, violates the law and ditch ethics with FULL knowledge. This is blatant cheating from VW. These customers did well to let VW know what they really feel after they paid their valuable money. I'm glad the owners are doing this, how many times have we heard "buyer beware" as if sellers have no obligation to be honest. VW bet the wrong way and now they are paying the price. If my car was affected I'll be doing the same. Someone said that these people aren't enthusiasts because enthusiasts won't trash their cars like this, actually the majority bought these cars just for their daily commute, a buy-back is not something to be wasted. Cars aren't and will never be family members, the vast majority of enthusiasts out there will ditch their beloved rides the minute they can afford something better. There is something better out there always. If the government ditched their regulations, would the program be cancelled? There's already talk of that. I am glad that VW is being ripped off. They have shown no remorse in India (because it is not required by laws). They are marketing the recall as 'software update' and forcing it on many customers. I believe this is the act of stealing of customers' hard earned money. Most of the owners must have picked VW over reliable Japanese, Korean counterparts due to the performance. If VW is snatching it away, it is plain robbery! Last edited by bhavik.1991 : 13th January 2017 at 15:31. So the people of USA are teaching a great lesson to VW, Now in our country the Govt's reaction can best be understood by the way the Bhopal tragedy has been treated till to date by the successive govts. So public, environment etc. is all secondary here. Here VW walks free with their tale of software update etc. Shame on you VW, for betraying on the trust we had on your cars, values and brand. All times are GMT +5.5. The time now is 11:59.